The Alpha cone sign is designed to fit both 750mm and 1M cones, secured by 50mm heavy duty elastic webbing. This gives the sign a secure fit and prevents the sign from spinning and being blown off in windy conditions. Constructed from a special blend of high impact recycled plastic that gives strength and durability, it will not warp or break in hot or cold environments. Made from 100% recycled material, it is light weight and easy to handle with no sharp edges. This makes the Alpha Cone sign ideal for quick deployment. 600mm and 750mm Triangular signs with supplementary plates are available as a one piece sign with interchangeable text. Sign Faces are printed onto M-Lite™ Class 1 Reflective Vinyl and standard Chapter 8 signs are available from stock with specials available on request. Donwload the Alpha cone sign PDF. 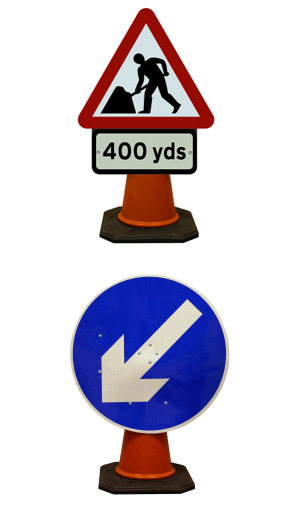 For further information on Viz Cone Signs, please contact us.